Cove Light AC HO RGBW is a high output, energy efficient LED cove fixture that is capable of producing high quality white light and dynamic colored lighting for a wide range of indoor lighting applications from alcove to wall grazing and indirect illumination. Comprising pure white and RGB LEDs in optimized configuration, Cove Light AC HO RGBW truly generates seamless color mixing and unlimited lighting effects. Equipped with 180° rotation axis for flexible aiming, the versatile design is available in different lengths for flexible installation up to 96 feet long. The simple cabling and connection make installation quick and easy. Cove Light AC HO RGBW is the perfect solution for a wide range of indoor lighting applications in retail, hospitality, and entertainment environments. Powered by AC line voltage – AC line voltage (120V/230V/277V) eliminates external power supplies enabling quick project setup thus lowers maintenance cost. True full color RGBW – 4 channel RGBW control provides full color dynamic effect. Seamless color mixing – Superior and flawless color consistency. Flexible aiming – 180° rotation axis allows flexible mounting and positioning in various environments. 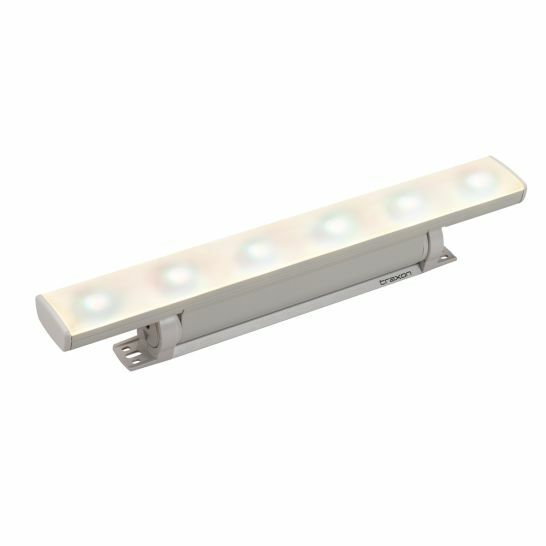 Versatile design – Low profile linear cove fixtures can produce solid white, solid color, dynamic white or color-changing light at various levels of intensity. Simple cabling and connection – Can be daisy-chained up to 96ft (or 32 pixels) allowing extended run lengths. High output and efficacy – Light output of 329 lumens per foot and an efficacy of 30 lumens per Watt. Multiple fixture lengths – Available in 1ft, 2ft*, and 3ft lengths to accommodate varying space requirements.